Mira Horoszowski was born in Warsaw, Poland during World War II. As a child, Mira was surrounded by seamstresses, where she learned how to sew and so began her dream of becoming a fashion designer. Mira moved to Canada in 1957 and earned a degree in Mechanical Engineering from the University of Toronto. Upon accepting a position with U.S. Steel, Mira relocated to Chicago and quickly fell in love with the city. When the company moved its headquarters to Pittsburgh, she seized the opportunity to stay in Chicago and pursue her life long dreams of venturing into the fashion world. In 1970, Mira opened the doors to her first boutique in the North Shore of Chicago. As her daughter Yvette grew up in the store and the business itself flourished, Mira saw both of her dreams come to life. Over the years, Mira has become a member of many committees and women’s boards and has immersed herself in numerous Chicago charities. In 1999, Mira was presented the Chicago’s Couturier of the Year Award by the Apparel Industry Board. Mira was also honored with the 2001 Heritage Award, honoring Polish American business leaders who have distinguished themselves in their chosen field. The Apparel Industry Board awarded Mira yet again in 2017 during its lavish Rev Up! Chicago Fashion Show at Perillo Rolls Royce dealership in the Gold Coast of Chicago. The event, an annual affair, features a fashion show featuring garments from Chicago’s most elite designers. 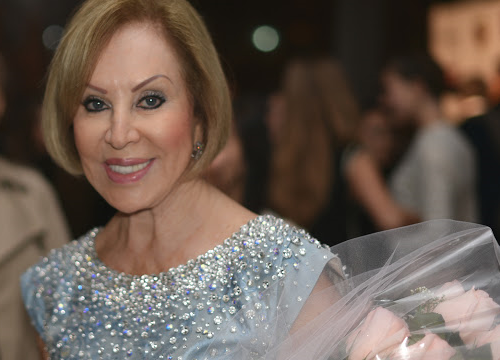 This year, the night was dedicated to none other than Mira herself, honoring her 47 years as a prestigious fashion designer for elite Chicago women. A red carpet welcomed some of Chicago’s most stylish, flutes of bubbly were passed about and tasty treats were snacked upon. Mira’s reputation exceeds her. She has designed for the most elite clientele including Susan Buffet, Juanita Jordan, Vanna White and Cindy Crawford. 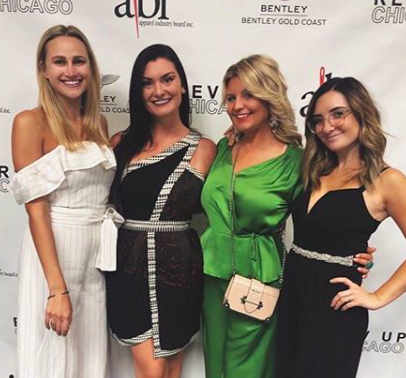 Mira Couture has been featured in numerous publications, shows and television stations, including Modern Luxury Weddings, Chicago Magazine, The Chicago Tribune, the Oprah Winfrey Show, ABC, FOX, WGN and more. Julie Mersine Romeli earned her Bachelor of Fine Arts in Fashion Design from the School of the Art Institute of Chicago (SAIC). There, she developed her passion for the avant-garde and an eye for couture design. Her work ethic, attention to detail and innovative designs throughout the SAIC program did not go unnoticed; in Spring 2008, her collection was hand-picked to be showcased in the Driehaus Awards for Fashion Excellence Show. 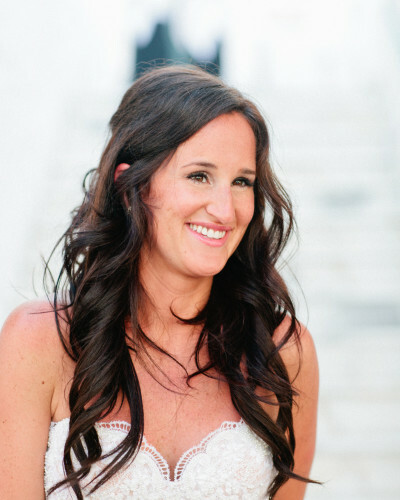 Following graduation, she immersed herself in the bridal industry. Working as a sales consultant and an assistant buyer in Michigan, she learned all aspects of the business first hand. Simultaneously, she started building the foundation for her own business, custom designing and producing bridal gowns, formalwear and specialty garments. In 2011, she discovered Mira Couture and had an instant connection with the founder, Mira Horoszowski. 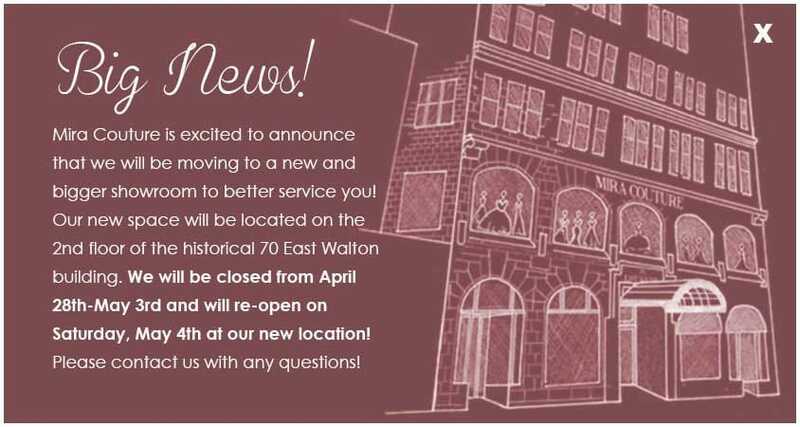 After designing and managing the store for many years, Julie Mersine became the new owner in September 2014. Julie strives to continue the success and expand upon the legacy set forth by Mira. She has given the brand a fresh new look by introducing her own line under the label Julie Mersine, exclusively designed and sold at Mira Couture. In October 2015, the Julie Mersine collection debuted at The Art of Fashion runway show in Millennium Park and received praise from critics and industry veterans. Since her debut, her designs have been shown in a multitude of other fashion shows and events around Chicago. Mira Couture’s standard for exceptional customer service is a result of our phenomenal team of consultants. Welcoming, friendly, upbeat, enthusiastic, caring and passionate–every experience at Mira Couture is nothing short of a breath of fresh air. Our consultants aim to make every customer feel like a part of our tight-knit family. Boasting degrees in Fashion Design, Merchandising, and Fine Arts from schools including Columbia College Chicago and Savannah College of Art & Design and vast experience in an array of other bridal boutiques, each consultant has an education which contributes to their expertise in the field of fashion, design, and bridal. Their background in the industry, whether it be an internship with a local designer or time spent writing and editing editorials for local bridal magazines, provides them with the tools and knowledge to advise and style each client’s desire, making every customer’s dreams become a reality. A major part of what makes Mira Couture so spectacular is the team of extraordinarily talented women who are responsible for constructing and tailoring of each magnificent garment. The head pattern maker hand drafts a custom pattern for every piece created, specifically drawn to each customer’s unique measurements. An entire staff of dressmakers represent the absolute elite professionals in their field. Some of whom have been with Mira Couture for more than thirty years, the culmination of their wisdom and experience is undeniably unparalleled in the industry. 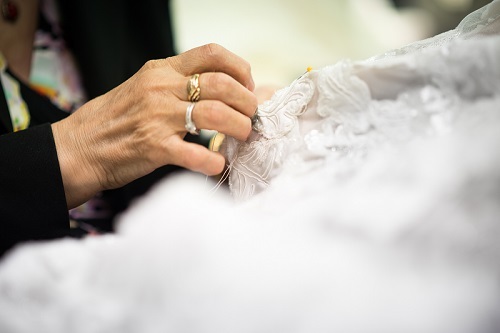 Many have received a formal training from Europe’s finest technical sewing schools but all have the delicate touch and incredible expert skill level to fit, construct, and alter the couture collections of Mira Couture. As Mira’s original idea for the business’s name was “Le Petite Yvette,” her one and only daughter, Yvette was truly was the inspiration for Mira Couture. Growing up in the store as a child and designing and working alongside her mother as an adult, Yvette’s life was dedicated to Mira Couture. She starting modeling at an early age and the beautiful and talented Yvette quickly became the face of Mira Couture. Crowned Queen of Poland in 1991 and Mrs. Illinois in 2001, she was internationally recognized for her style and poise. Yvette has graced the pages of InStyle and Harper’s Bazaar, as well as the covers of magazines from Today’s Chicago Woman, Country, and North Shore, to Sew News. In recent years, Yvette’s involvement with Mira Couture began to shift into an advisory position. She has played a major role in determining the future of Mira Couture and helped transition the business to Julie Mersine. In 2015, Yvette wrote and published her first novel, “Brides Unveiled.” Although a fictional story, she touches on some of her personal experiences at Mira Couture. Yvette can still be found at the store some days designing for her private clients and is still involved in the marketing, special events, and promotions of Mira Couture. Although she claims her new position at Mira Couture is being it’s number one fan, she will always be the muse for Mira Couture.